It’s impossible to get away from Simon Godwin at the moment. His RSC Hamlet has only just finished touring; his Antony and Cleopatra at the National has been winning awards, and he’s just about to take up the artistic directorship of the Shakespeare Theatre Company in Washington DC, as well as directing a production in Japan later this year. And in the middle of all this, he has taken on Timon of Athens, the first Shakespeare in some years to play in the Swan. There’s an interesting canon story to tell here. The plan of the RSC was to do all of the Folio plays in the main house and live stream them to cinemas; yet Timon has ended up in the smaller space, and has been filmed for asynchronous broadcast/later release. The liminal position of a play that almost didn’t make it into the Folio in the first place seems to be reflected in the peripheral nature of the production’s conditions. 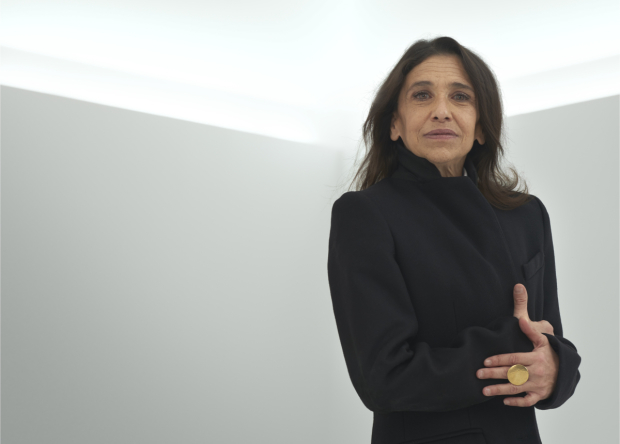 And yet, bringing together Godwin and RSC Associate Artist Kathryn Hunter in the title role, along with an enormous cast (most of whom were in Tamburlaine) does suggest a level of investment. Timon may be on the fringes, but the production still pulled out all the stops. Hunter was, as ever, enthralling. Her diminutive Lady Timon presided over a golden banquet hall, with enormous tables dominating the stage and all of the settings gold-plated. In elegant dress, Timon was a kindlier Norma Desmond, presiding with grace and dignity over a dwindling estate, and entirely oblivious to how quickly that estate was dwindling. In her prime, she joined a burlesque-style singer (the extraordinary Dunia Botic, whose middle Eastern melodies underscored the whole production with intimations of the sacred, a prayerful lament for Timon’s fall) to dance on tables, and benevolently forgave debts. She was born to be the hostess, and played her part consummately. Timon’s sycophantic hangers-on dominated the stage for much of the first half, and Godwin played up the satire for all it was worth. Sager I M Ayra’s Painter had created an abstract image of Timon that everyone hated, though no-one was rude enough to say so. Ralph Davis’s Poet was beautifully improvisatory with his words, nervously bookish but defensive in his flowing praise. And the nobles who would go on to stand for the worst of Athens – Sempronius (James Clyde), Lucia (Imogen Slaughter) and Lucullus (David Sturzaker) were cloying in their obeisance, yet grabbed for the goodie bags Timon left on the table as soon as her back was turned. The satire was undercut throughout by Godwin’s enormously disruptive pattern of asides, which involved near-complete pauses in the main action, and were underscored by lighting changes and sound cues. So much is standard, but the frequency of their use forced much of the first half into a stop-start pattern that prevented anything building up. Nia Gwynne’s sardonic Apemantus was the initial beneficiary of these, but there was so much going on during her asides – the sound, the lights, the sycophants going into a slow-motion mime of a banquet – that it was difficult to connect what she was saying with the stage image. It also had the odd effect of making her sarcasm a private affair, which left Apemantus seeming like a hypocrite who spoke what she thought behind their backs rather than to their faces. The privilege of the aside was then taken over by Patrick Drury’s Flavius, who had more success given that his asides actually function as such – a sudden light on him as he revealed to the audience that Timon’s finances were running low was an effective cold-water moment – though the impact of the device was undercut by its overuse with Apemantus. Other choices in the build-up to the climax of the first half didn’t work as well as they might have sounded on paper. Godwin combined the three scenes of Timon’s servants appealing to friends for help with one another, so three one-on-one conversations happened across one another simultaneously on the stage. The stage picture was effective, but much too muddled; and the whole scene played with two groups frozen while the other moved, with one or two lines for each at a time, creating what works as a drama of repetition and increasing dread into a mass refusal. It worked against the development of any of the individual characters – Clyde’s Sempronius felt particularly wasted here, the impact of his chagrin at being the last person to be asked lost in the midst of several other conversations – and meant that the desperation of Timon’s situation developed rather suddenly. Timon’s final party, however, was effective. With no tables, the guests were invited to sit on large cushions, a kind of poverty chic that bought into the general middle-Eastern/Mediterranean aesthetic. Timon served up dishes of blood, which she first poured over herself and then threw over the partygoers, who were then hosed down by her loyal servants. The bitter joy that the servants showed in this came as a welcome release for them after their clear helplessness when denied money by Timon’s friends, and after their hassling by creditors outside Timon’s house. The first half ended with Hunter’s first really standout moment, alone onstage, where she delivered Timon’s farewell to the city with a grandstanding relish that transcended the materiality of her condition. The play’s second half transferred to a squat, made up of rubbish and barrels, among which Hunter’s now Beckettian Timon slept under a blanket and turned off an alarm clock grumpily. This half contained more deviations from text and physical comedy from Hunter, and made me wish I was watching a much more adventurous production where she had free rein to clown and rail. Her best sequence came with the Poet and Painter, as she ad-libbed while making them drink piss, and then kicked them both hard before sending them scurrying away. Her hollow glee over the gold she found and the effect it had on others was uncanny; the three thieves, in particular, went from preparing to assault her to standing dumbstruck and unable to touch the gold in its casket. And yet there was much that was moving in this half too. While Apemantus felt under-used in the production generally, the finest scene was between Apemantus and Timon. Timon matched Apemantus tone for tone, and got under Apemantus’s skin – she even started forward when Timon showed her the gold, before remembering herself. At one point Apemantus started really enjoying their back and forth, and the two began chasing one another in circles as they traded insults back and forth – and then suddenly Timon broke down and embraced a shocked Apemantus, finally giving vent to her despair. This breakdown made sense of her treatment of Flavius, too, holding him up to the gods as one righteous man, and staring at him with the wild happiness that sometimes lies on the far end of sadness. The production’s biggest misstep, however, was the treatment of Alcibiades (Debbie Korley) as an activist. Korley’s very presence at the banquet in the first half made little sense in this context, especially as she barely registered any discomfort with the conspicuous consumption she would soon be protesting. In the second half, she entered at the head of a large group of yellow-vest protesters, who were now campaigning against greed and singing French protest songs. This would undoubtedly have played better early in the production’s run, when those protests were largely confined to France; since the co-option of the movement by the far right in the UK, however, the semiotics of the scene were confusing, and instead exaggerated the glibness of the attempt to make a contemporary reference. The fact that these protesters then took up arms and held the nobles of Athens at gunpoint in a clearly military operation (even with one protester descending by rope) further confused the image, especially when combined with Timon’s former servants signing up to the cause. The yellow vests were simply a superficial and tasteless glimpse of something current, and Godwin seemed unconcerned about the conflation of various political ideals and the idea of popular protest with paramilitary organisation. Another excellent review. The stress on asides and the presence of women in all the key roles made it seem almost more entirely a Middleton than Shakespeare play for me, although the King Lear resonances were brought out well in the second half. I agree about the muddled political signifiers, though they perhaps invited some thinking back to Grexit as well as recent French politics, which would make the current right-wing connotations of yellow jackets somewhat appropriate. Thanks Susanne. Hadn’t thought about the Grexit connotations, but I can see what you mean, and what the production might have thought it was doing!